A Vegas-Themed Merchant Of Venice? Tim Steed, Raphael Sowole and Scott Handy. Photo by Ellie Kurttz. 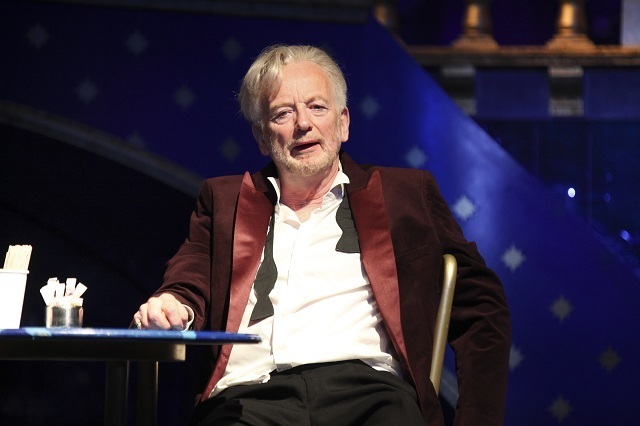 Ian McDiarmid as Shylock. Photo by Ellie Kurttz. Emily Plumtree and Susannah Fielding. Photo by Ellie Kurttz. How things change: the London theatre establishment once sneered at the likes of Al Pacino for daring to perform Shakespeare's verse in an American accent, but now it's the English who are aping the yanks. In the Almeida's new Vegas-themed Merchant of Venice we get valley girls, mid-west cowboys, hip-hop gangstas and a Tennessee twang. Rupert Goold’s latest production is overtly brash and joyfully trash-tongued, though make no mistake, the accents here are used squarely to connote vulgarity. English snobbery intact then. The pimped-out, blinged-up stylings of this London transfer of Goold’s Stratford-upon-Avon hit of a few years ago, deliberately aim to play up the fact that this is Shakespeare's most obnoxious play, with the action swirling around a group of self-involved racists and a money-grubbing Jewish villain. 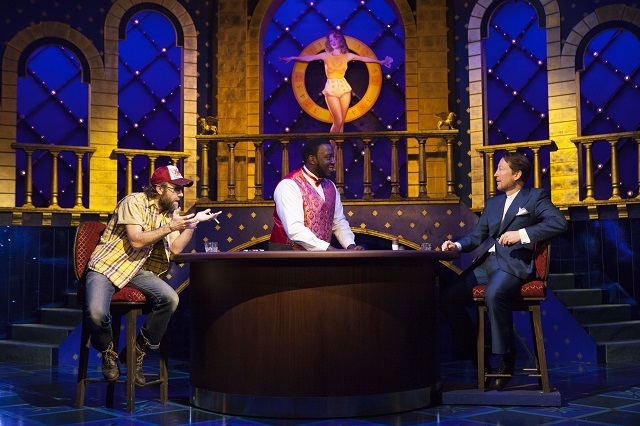 Tom Scutt's expensively cheap set depicts a USA in the thrall of mammon: Venice via Vegas in the imaginary (though totally believable) Rialto Hotel complete with fruit machines, dancing girls and constant shopping ads on TV. This gimmicky conceit does throw up some cute gags: with the fool turned into a cheesy Elvis impersonator and the marriage challenge at the centre of the story re-imagined as a naff game show. These individual elements are fun and clearly the cast are having a ball — Susannah Fielding as Portia stands out from an exuberant and very watchable cast. But an approach so clotted with irony also creates a number of problems that ultimately end up weighing the play down. Chief among these is the fact that so much surface detail makes it hard to take the story seriously. Ian McDiarmid struggles to break his Shylock free from the cartoon this character always threatens to be (his take is oddly reminiscent of Laurence Olivier's Dr Szell in the film Marathon Man). The pacing is also all over the place and some scenes are simply too overloaded with pop culture: the 'pound of flesh' court-case is played out like something from The Sopranos, which soon becomes confusing — is this real or street justice? All that said, there is much to enjoy here; the fizzy tastelessness is in the end justified by the broken-backed source text that — though still having its insistent defenders — is a pretty uncomfortable watch today. Goold's take, following hard on his equally irreverent productions of American Psycho and King Charles III is rightly disrespectful. The Merchant of Venice runs at the Almeida Theatre until 14 February 2015. Tickets £9-£45. Londonist saw this play on a complimentary ticket.